On Dec. 14, six educators were killed trying to protect their young students during a school shooting at Sandy Hook Elementary School. who acted courageously that December morning. 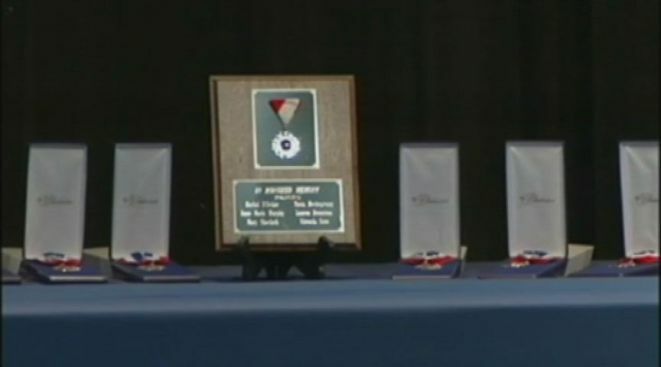 During a special ceremony, three recipients of the Medal of Honor presented the Congressional Medal of Honor Society’s highest civilian award, the Citizen Honors Medal, posthumously at Newtown High School. The families of the six women attended to accept the Citizen Honors Medal during the ceremony. The Medal of Honor recipients also presented the Citizens Medal of Honor Society’s Certificate of Commendation to all of the teachers and staff of Sandy Hook who acted courageously during the tragedy. In the weeks after the shooting, there were dozens of nominations for the medals to go to teachers and staff at Sandy Hook. “Many teachers and staff members disregarded their own safety that day to hide and protect the children in their care. Those acts of courage, sacrifice, and selflessness are the very same traits identified with the Medal of Honor; only they were demonstrated at a critical moment in hometown USA, not on a battlefield far from home. Recognizing these ordinary Americans who performed extraordinary acts at home is the very reason for our Citizen Honors program,” Harold Fritz, president of the Congressional Medal of Honor Society, said. In February, President Barack Obama bestowed the Presidential Citizens Medal, the nation’s second-highest civilian honor, on the six adults killed in the school shooting.